I started listening to your podcast and I laughed because it reminded me of all the time I spent with my girlfriends listening to NKOTB! My obsession with NKOTB started in 1988 I think. Heard their song and had to get the cassette. As I got more into them, my room became covered with posters. Then it was the pictures from the magazines. There wasn't a space in my room that didn't have New Kids on it. My best friend and I were Jon and Jordan girls. I had the Jon doll and she had Jordan. We thought if we married them we'd be related and it would be awesome! Secretly, I had an obsession with the bad boy Donnie! I had dance moves down pat and all I could think about was getting to meet him. We went to four concerts at least always trying to get to the tour bus for a chance to meet them. We also checked out every hotel in PHILA trying to find out where hey were just for a glimpse. When they broke up I was devastated! I couldn't believe it was over. Even though they were no longer together you never forget your first loves, the real kind that when you hear a song it takes you right back to that happy time. A few years later we were with a friend on New Year's Eve and his phone rang. I asked him if he was going to answer it and he said no I call them back. When he checked his messages it was from Jordan's mom wishing him a happy New Year! Needless to say, I flipped out! I'm telling him call her back ask about Jordan. Where are they? Can we get together? He thought I was crazy! He knew I liked them but he never saw me like that! When they were in NY in the pouring rain I tried to get him to go with me so that maybe I'd be able to meet them but with no luck! When they announced the Main Event tour, I knew we had to go. I called my friends and we had to go! My husband got us tickets and with pretty good seats it was awesome! I tried to get over 75 people to just get near Donnie when he was off the stage! My son heard me talk about the concert and watched the videos so he began listening to the music. When we go in the car, we listen to NKOTB and sing along. It's so bad, he wants to hear Crash & Dirty Dancing so he can sing them. We watch Blue Bloods, Wahlburger's, and Donnie ️s Jenny! He knows all about Donnie and said Donnie and Joey are his favorites. When we got the cup from joining BH nation and I found out Joey was going to be close to my house I waited 6 hours to get a selfie and have him sign the cup but we were only aloud selfies. When we went back later on to go grocery shopping I saw Joey leaving and did what I had to do to get my son to meet him. He said it was awesome but he really wanted to meet Donnie! So we went broke, bought VIP for the Total Package tour, and we both got our chance. It was bucket list for me and something he'll always remember mommy and daddy did for him. Keep in mind he's only 6! Before the show, we asked him what he was going to say to Donnie. He said he wanted to ask about Blue Bloods. We both said that was ok but I'm sure others will ask that. What is something you really want to know. He said about Donnie's dog Lumpy. I said what do you want to know? He said if he brought him with him. Our moment arrived time for the meet and greet. We went in and as soon as Donnie saw Ayden, he picked him up! It was an incredible moment! If I weren't in shock, I probably would have cried like I did meeting Joey! I said to Donnie, my son loves you and wanted to ask you something. He said sure. So A asked, is Lumpy here? Donnie said, hang on a second and the next thing we knew, a curtain was pulled back he whistled and called Lumpy and he came out running. We got to stay a little while longer than the 5 minute meet and greet, play with Lumpy and have Donnie take a selfie with us and one with us and Lumpy! I will never forget this moment! My son now thinks we are best friends with Donnie and I can just hit him up on twitter or fb and ask him if he wants to come over. He wants to know if I miss Donnie and Joey and if we can see them again. I tried to explain they have lives, jobs, children, etc but he's still on a concert high and wants Donnie to come to his birthday! Needless to say, I'd fall over if we heard back from him in any way! He truly is an amazing man! The things he does for his fans and others astounds me! I have so much respect for him! Even if that was my only chance in life to meet him, I know I'll treasure it forever. It also makes me happy to know my 6 year old and I have a connection through NKOTB! BH️forever! I'm attaching some photos of our experience! So ... I'm on my laptop now. Well, George Michael concert was amazing. It was back in July 2007, the stadium was full and he was awesome. He sang all the favorites, including some of Wham hits, he even spoke Greek! He was all alone in a huge stage and somehow he managed to fill that stage. No dancers ... just him. Amazing! A true star. One of the kind! Amazing experience, I'm happy that I have these memories. I've learned about his passing when Jon twitted about it. It was such a sad day. One the other hand, a concert that didn't go as everyone expected was Madonna's live in Athens in 2008. Everyone including me had high expectations about this concert. You don't see Madonna live everyday! But it was .... not good. The sound was awful and she definitely did lip-syncing in the majority of the setlist. Too many dancers, too many lip-syncing ... that make me not want to go to another concert-show, so I skipped JLO and Beyonce. I like more intimate concerts, if you know what I mean ... Oh! I skipped also Kylie's concert. By Kylie I mean Kylie Minogue, If you were around in the 80's there's only one Kylie (Minogue), if you are younger ... then probably it will be Kylie Jenner! But the ultimate concert for me was Duran Duran in June, 2006. They were playing with all the original members and seeing them on stage (I was pretty, pretty close) brought tears in my eyes. It was too emotional. Growing up I had their posters on my bedroom wall (before NKOTB) and now I was able to see them live in front of me! It was surreal! But those tears were not only because I was seeing Duran Duran live, it was because at that point I realized that I will never feel this way for NKOTB because they had split. I remember after the concert was over and everyone was talking about how amazing they were (they really were! ), I was thinking that I'd give anything to feel this way for NKOTB, I'd give anything to watch them perform. It was a bitter sweet moment. I still will give anything to watch them live but between you and me ... I know that this ain't gonna happen. Time is not on my side. They barely do any concerts in Europe and when they did I was either pregnant or raising my babies. Hopefully they will add some European tour dates soon, and hopefully I will be able to travel to somewhere in Europe to see them perform because let's face it they will never perform in Greece! It's hard being a non USA NKOTB fan, if you know what I mean. Your chances are so limited. I know they say that the Cruise is a great chance for all fans from all over the world to connect but I'm sure you are aware of the cost and adding an international flight to this makes it impossible. The cost is huge! After all, I've seen Rock This Boat and read some stories about the cruise that scared me and I don't know if I really want to do it ... anyway. Too much drama! Talking about New Kids ... the mania was huge here in Greece. All the girls were in love with them and played their songs over and over again. The first song I ever heard was "The Right Stuff" and it just clicked. The next day went out and bought the Hangin Tough cassette. I was a Joey girl, he was the only one close to my age and seemed a nice guy! I had all the albums, including their first one. I remembered that I've founded it in a local music store but they had it only in vinyl and although I didn't had a player I bought it anyway and my uncle copied it into a casette for me! Anyway the NKOTB mania in Greece lasted up until the No more games album, then everyone shifted to more grunge music (Nirvana) or to some kind of "aggressive" music (like Prodigy etc). Everyone grew up and wanted something ... cool. But as with life, you never forget your first true love. Words come right up your mouth when you hear any of their old songs and you are so surprised with that because you can't remember what you ate last Monday but you seems to remember every word of "I remember when" song from 30 years ago. Up until I see them live one day, I'm glad for the connection they have with all of us - the fans. Personally, it make me feel so special and a part of this unique BHFamily. I'm grateful for all the Facebook lives (thank you Jordan!) and all their tweets, they sure know how to put a smile in everyone's face. I'm thankful that Danny follows me on twitter (YES!) - and his dog Taco on Instagram and I may have gotten a Tweet from Donnie on New Year's Eve but deep down I know that they don't know who I am and I don't mind. I feel special for this connection I have with them. I'm not a groupie, my life isn't the NKOTB ... I have a husband, kids, job, life, priorities but sometimes the fun girl comes out of me and ... who doesn't like to have fun? Duran Duran Concert - I didn't bring my camera because at the back of the ticket was written that cameras weren't allowed - little did I know, it was my first big concert! I'm sending you a photo that I've found on the internet from that show instead. George Michael Concert - No comment! 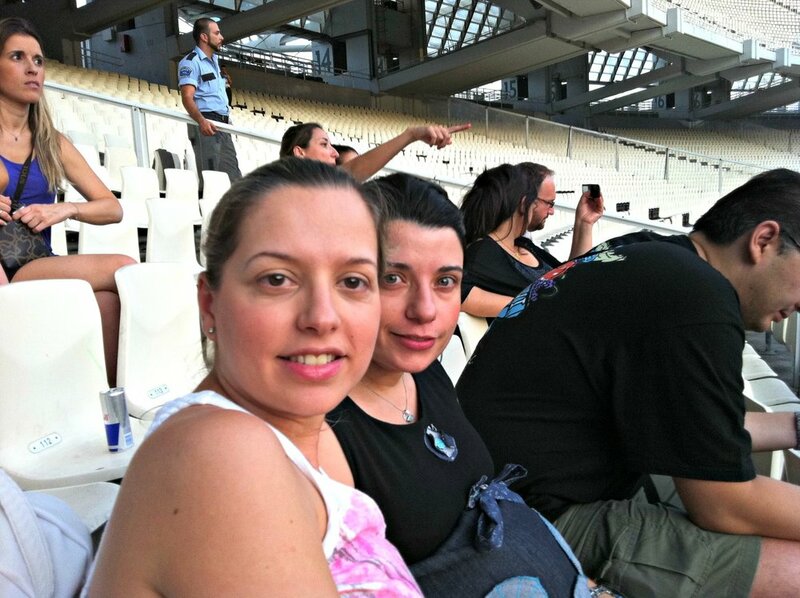 Madonna Concert - Me and my partner in crime, my brother Spiros. Bon Jovi Concert - Me and my - over 30 years - bestie Rania. I had left my 3-month-old son with my husband that day and Rania was 7 months pregnant with her first son that time, so we played safe and got ourselves some seat tickets, not too close but not too far either. NKOTB Memorabilia - That photo is the only thing that I have from my first NKOTB days. I'd bought it at the local music store around 1990 - 1991 and I remember that Rania (my BFF, huge Jordan girl) and I used to talk about what our NKOTB concert would be like, what should we were and how on Earth would be able to meet them. 30 years later and still no NKOTB concert for us but we've promised each other that on their next European tour we will travel to whatever city to see them. I want to cross NKOTB concert off my bucket list but I'm sure that when and if this ever happens I'll be addicted and I will want more. Bottom line back in the day, my life and every teenager's life was involved around music. We hung out to each other's houses to listen to music, we exchanged cassettes, we made mix tapes, we duplicated cassettes using these double cassette play recorders and I remembered knew every song on UK & USA Top 10 and which one was the #1. Once again, I want to thank you for the opportunity to have my story heard. Your podcasts are amazing. I love listening to you on my way to work, it feels like I'm sitting with my friends and have girls talk. Sending #bhlove all the way from Greece.